These evenings are nice and quiet. I’m adjusting to the fact that yes, I’m pregnant, and I won’t be able to do this kind of lounging forever. And it’s ok to vocalize my brief periods of excitement – like when my recent Etsy purchase for Wesley came in the mail this week – and nervousness regarding parenthood through media such as facebook and twitter. I shouldn’t worry if it offends some or annoys others. After all, they CAN hide or unfollow me. So, I sit, feeling this baby punch and kick at my sides, as I watch the odd and frustrating flirtation between Lois and Clark. Usually I coincide research projects on various mom and baby products while the show entertains me. (Currently I’m looking into used cloth diapers and patio furniture.) The dogs get tired or bored and snuggle next to me. This is life right now, and I’m loving it. Stomach full on Green Bean Delivery pork chops, finished off with a Skinny Cow from Costco (where I successfully only spent $40 today! ), I’m able to catch up on my blog posts before watching the next 3 games of March Madness tonight. I’m sure it’s because I’m hyped up on hormones, but I can hardly watch the news coverage about the earthquake and tsunami devastation in Japan. Today marks the one-week anniversary of the terrible events, and the rising number of death counts brings me to tears. Even videos of non-people-related footage terrify and sadden me – like this video of a poor dog trying to find help for his injured friend or this frightening footage of liquefaction in Tokyo. It’s disaster like this that once scared me about bringing children into this world, but I know that’s an entirely ridiculous, selfish thought. God has a plan, and even though it may not make sense to us, he writes it perfectly. In the last weeks, I’ve become more attached to this little person growing and maturing within my belly. It’s a very strange position to be in. I wouldn’t say that I’ve completely bonded with him yet, and I’m not sure if it’s possible until he’s actually born, but I’m much more aware of his presence and the role I’m about to play. As I feel more kicks and pushes, I realize there’s a little body in there that needs to be clothed. This is truly one of the most fun and entertaining areas of parenthood. At lunch today, I ran across this etsy must-have, and quickly purchased Wesley’s hospital departure outfit. 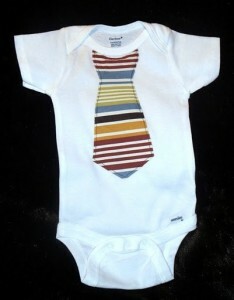 He’s going to be one little dapper man. I’ve felt more comfortable with the idea of being pregnant in the last month or so. At first, it was strangely embarrassing, and not something I wanted to dwell upon. I didn’t really like people asking me about how I was feeling (fine, nothing different really) or if we were going to find out the gender (of course!) or if I was excited or nervous (not sure). It was more of a confusing stage of life, and I didn’t know what to think of it. Now that I’m out of the “pregnancy closet” and I’m actually starting to show, I don’t mind the questions and baby banter so much. I don’t want to be annoying about it, as I’ve witnessed some new mothers become. I don’t want to be insensitive, as I know plenty of girlfriends who would love to be in my shoes and for whatever reason cannot be at this point in time. But I also don’t want to be a Negative Nancy. I’m tired of being embarrassed and nervous about having a child. Don’t people do this all the time?! March has been a month of (emotional) madness, alright. “Swollen with hormones,” as one pregnancy book tells me I am, I’m ready to welcome April and a more consistent spring sun! Did you know that you’re breach? Well, I can prove it. Your kicks against my bladder are making trips to the bathroom more frequent than normal. You might even get a kick out of it. Does this mean you’re going to be a tease like your dad? You’ve already inherited long limbs from him; I can only imagine what your personality will blossom into! I’m so relieved that your echogenic intracardiac focus is nothing to be afraid of. Our visit to the special doctor confirmed that the little white spot on your heart is nothing more than a calcium deposit. Let’s just keep the surprises at bay, shall we? We love you and don’t want any harm to come to you. You must be sleepy. 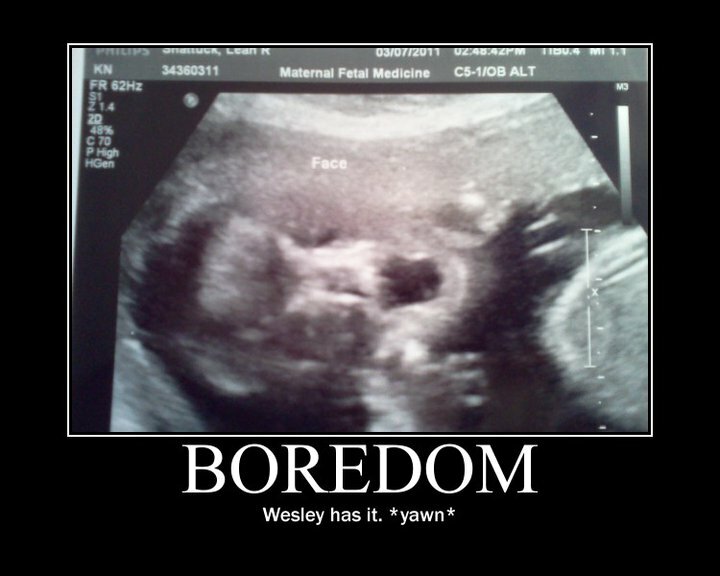 Or perhaps this whole “in the womb” thing is pretty dull to you? Nevertheless, it was pretty cute to catch your z’s on the ultrasound. The special high-definition ultrasound was great; it wasn’t a 3D u/s, but we were able to see your growing little heart, brain, kidneys and toes clearly on screen. I could almost tell what your little face looks like. Keep on growing, little one, and get that calcium deposit used up. We don’t want it to cause any problems for you down the road, if it can be helped. You’re pretty snug and secure within, and I’m glad for your safety. I hope and pray that we can provide a safe environment for you when you finally make your presence. This will be new to all three of us, so we’re in this together. I know we’ll make mistakes from time to time, but we will try to be great parents to you. You’ve got an entourage of people who love you already and are anxiously awaiting your arrival. I can’t wait to meet you in a few months! As an advertising major, I can honestly say this is one of my absolute favorite commercials. I don’t remember the exact year (circa 2000), but it continually pops in my head, which must mean that it’s good. When we found out that Baby Shattuck is indeed a BOY, I knew I had to post this video! I’m not going to be that horrible mother who posts groin photos all over a blog (though they are on my facebook page), but I can definitely say that our 14 week ultrasound photo was correct! We had the big gender ultrasound yesterday, which confirmed what we have hoped and thought. It would be strange to find out this baby is actually a girl since we’ve thought of the baby as HE for these last 6 weeks. 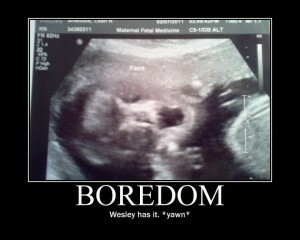 This is exciting news because now we can officially call him Wesley. We definitely don’t have good choices from Leah’s side of the family. Ronald Eugene, Donald Floyd and Darrel Theron. What were my female relatives thinking? The running joke is to name this baby Ronald Donald. I’d welcome some ideas. Thank goodness we have 19 more weeks to get a name put together!